Conventional diagrams of the Internet include servers and routers and so on, but they leave out the most numerous and important routers of all: people. The problem is, people have limited time, attention and accuracy—all of which means they are not very good at capturing data about things in the real world. not things, objects! Ashton writes about objects. people are not good at capturing data, so let’s filter (i.e. introduce a bottleneck) the data for them, thank you! however, people arrive to gather around ideas and to discuss despite the fact that “conventional diagrams of the Net leave out people”. By having public discussions around an “idea” people arrive to filter creatively the information dump without resorting to artificial bottlenecks. Non-human bottleneck stifle discussions! We’re physical, and so is our environment. Our economy, society and survival aren’t based on things or information—they’re based on objects. You can’t eat bits, burn them to stay warm or put them in your gas tank. Things and information are important, but objects matter much more. Yet today’s information technology is so dependent on data originated by people that our computers know more about things than objects. This looks like the credo of the Internet of Objects! 2. What are, for people, things and objects? A thing was the governing assembly made up of the free people of the community, meeting in a place called a thingstead. Near to us are what we usually call things. The jug is a thing. What is a jug? We say: a vessel. As a jug, the vessel is something self-sustained, self-supporting, or independent. An independent, self-supporting thing may become an object if we place it before us. An object is a reification of a thing. An object is therefore real, but all about thing and thingstead is lost. Reification (computer science), making a data model for a previously abstract concept. On 20 May 1515, an Indian rhinoceros arrived in Lisbon from the Far East. After a relatively fast voyage of 120 days, the rhinoceros was finally unloaded in Portugal, near the site where the Manueline Belém Tower was under construction. The tower was later decorated with gargoyles shaped as rhinoceros heads under its corbels. A rhinoceros had not been seen in Europe since Roman times: it had become something of a mythical beast, occasionally conflated in bestiaries with the “monoceros” (unicorn), so the arrival of a living example created a sensation. The animal was examined by scholars and the curious, and letters describing the fantastic creature were sent to correspondents throughout Europe. The earliest known image of the animal illustrates a poemetto by Florentine Giovanni Giacomo Penni, published in Rome on 13 July 1515, fewer than eight weeks after its arrival in Lisbon. Valentim Fernandes, , saw the rhinoceros in Lisbon shortly after it arrived and wrote a letter describing it to a friend in Nuremberg in June 1515. A second letter of unknown authorship was sent from Lisbon to Nuremberg at around the same time, enclosing a sketch by an unknown artist. Dürer saw the second letter and sketch in Nuremberg. Without ever seeing the rhinoceros himself, Dürer made two pen and ink drawings, and then a woodcut was carved from the second drawing, the process making the print a reversed reflection of the drawing. 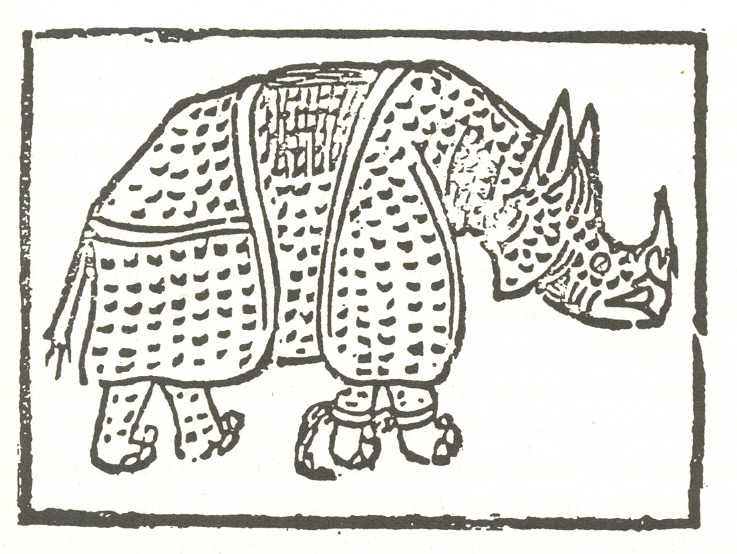 “ On the first of May in the year 1513 AD [sic], the powerful King of Portugal, Manuel of Lisbon, brought such a living animal from India, called the rhinoceros. This is an accurate representation. It is the colour of a speckled tortoise, and is almost entirely covered with thick scales. It is the size of an elephant but has shorter legs and is almost invulnerable. It has a strong pointed horn on the tip of its nose, which it sharpens on stones. It is the mortal enemy of the elephant. The elephant is afraid of the rhinoceros, for, when they meet, the rhinoceros charges with its head between its front legs and rips open the elephant’s stomach, against which the elephant is unable to defend itself. The rhinoceros is so well-armed that the elephant cannot harm it. It is said that the rhinoceros is fast, impetuous and cunning. Comment: you can see here a thing taking shape. Despite its errors, the image remained very popular, and was taken to be an accurate representation of a rhinoceros until the late 18th century. The pre-eminent position of Dürer’s image and its derivatives declined from the mid-to-late-18th century, when more live rhinoceroses were transported to Europe, shown to the curious public, and depicted in more accurate representations. 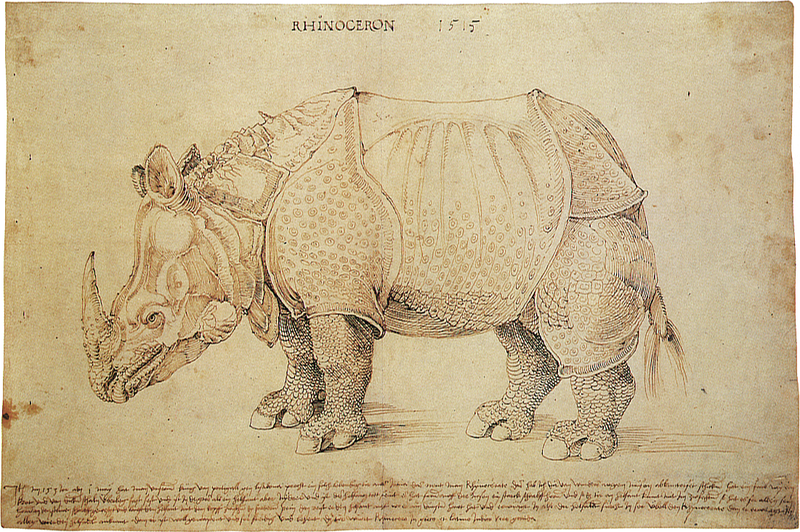 Until the late 1930s, Dürer’s image appeared in school textbooks in Germany as a faithful image of the rhinoceros; in German the Indian rhinoceros is still called the Panzernashorn, or “armoured rhinoceros”. 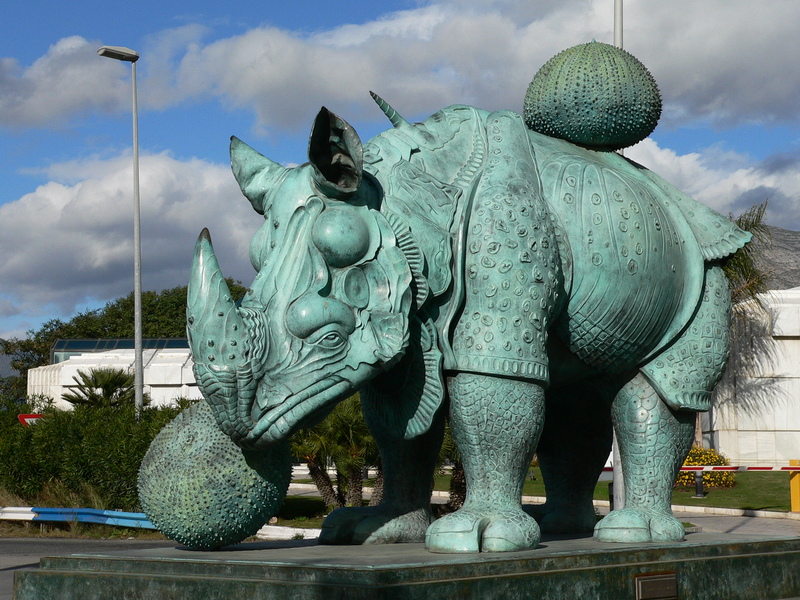 It remains a powerful artistic influence, and was the inspiration for Salvador Dalí‘s 1956 sculpture, Rinoceronte vestido con puntillas (Rhinoceros dressed in lace), which has been displayed at Puerto Banús, in Marbella, since 2004. Comment: that is an object! You can stick an RFID to it and it has clear GPS coordinates. Who is to be concerned? What is to be considered? How to represent the sites where people meet to discuss their matters of concern? How does the Internet of Objects respond to these questions about things and thingsteads? People are going to use the Internet of Objects as an Internet of Things. How can we help them (us!) by designing a thing-friendly Internet of Things? My guess and proposal is to try to put space (i.e. thingstead) into the IoT. By design. 5. Not the RFID space. Not the GPS space. This may be useful for the goal of inhuman optimization, but will not promote by itself the conversation needed to have around things and their reifications, the objects. People are going to divert the ways of the IoT, designed with this lack of appetite for human communication, as they succeeded previously! For understanding why RFID and GPS are not sufficient, let’s imagine, like Borges, that the world is a library. Is this enough for me, reader, who wants to retrieve (and discuss with other readers about) a book without knowing it’s title, nor it’s position on a shelf? No! I have to call a librarian (the bottleneck), an inhuman and very efficient one, true, who will give me a list of possible titles and who will fetch the book from the right shelf. I don’t have direct access to the library, nor my friends which may have different ideas about the possible titles and shelves where the book might be. My personal library serves as extension of my brain. I may have read all my books, but I don’t remember most of the information. What I remember is where in my library my knowledge sits, and I can look it up when I need it. But I can only look it up because my books are geographically arranged in a fixed spatial organization, with visual landmarks. I need to take the integral of an arctangent? Then I need my Table of Integrals book, and that’s in the left bookshelf, upper middle, adjacent to the large, colorful Intro Calculus book. 6. What else? These notes are already rich enough, therefore please be free to stop reading, if you feel like. Actually, this is a technical problem: how to create space where there is none, without using arbitrary names (RFID) or global (but arbitrary) coordinates (GPS)? It is the same problem which we encounter in neuroscience: how the brain makes sense of space without using any external geometrical expertise? how to explain the “brain as a geometry engine” (as Koenderink) when there is no rigorous model of computation for this brain behaviour? There may be a point in holding that many of the better-known brain processes are most easily understood in terms of differential geometrical calculations running on massively parallel processor arrays whose nodes can be understood quite directly in terms of multilinear operators (vectors, tensors, etc). In this view brain processes in fact are space. I have two proposals for this, which go far beyond explanations which may fit into a post. I put them here only for the sake of giving an explanation of the motivations I have, and maybe for inviting the interested people to gather for discussing about these things. It is about “computing with space”, which is the middle name of this blog. The first name, chorasimilarity, is made by gluing Plato’s notion of space “chora” with (self-)”similarity”, which is, I believe the essence of transforming space from a “vessel” into a self-sustaining, self-supporting thingstead. The first proposal is to concentrate on completely asynchronous, purely local models of distributing computing as a low-level basis for the architecture of a true IoT. UPDATE: May be relevant: Launching the Wolfram Connected Devices Project. 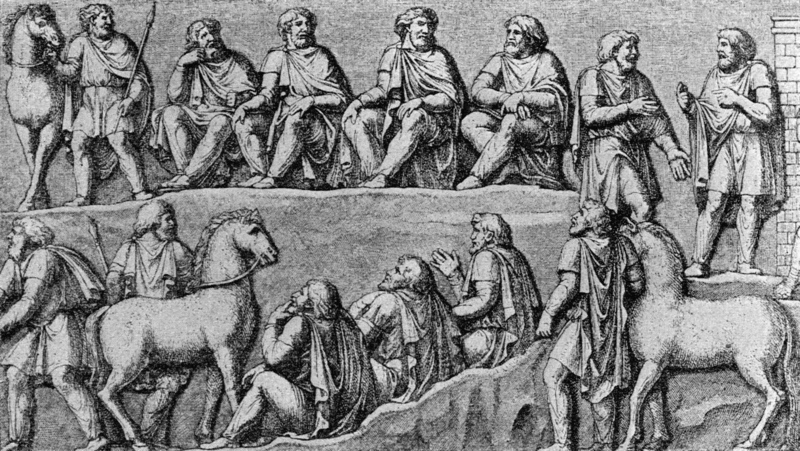 It is based on actors which gather in an agora to discuss things that matter. Literally! But there is long way to arrive to a proof of principle, at least, for such a space-rich IoT, which brings me to the second proposal, which (may) be too technical for this post, alluded here: A me for space. I have trouble changing how I associate the words “thing” and “object” despite arguments to the contrary. In computer science, an object is the subject of inputs that exhibit behavior. A thing to me is a physical object. I have trouble thinking of things like happiness as things. People think of the internet of things as physical devices like refrigerators. They do not consider bank accounts or software programs as part of what is included in the internet of things I have used internet of objects to refer to the broader meaning of a thing. I am left with the belief that we cannot make a reasonable context free distinction between thing and object. Well, you have the latin “res” for it, if you want. Which gives “real” in English. The confusion of meanings between thins and objects is recent and well documented. But this is not the point. Anybody may use any word, like “shue”, why not? The point is that the IoT is designed with aversion for discussion, but it will be used for super-discussions, with physical effects in the real world. As it should. As we forgot how to do it. We accumulate objects and we are still lonely, because we long for the things, for the res, not for the dead outcome of it, the object. Okay, things are reified objects possessing perceived objecthood, I suppose…. thobjecct: object of thought including physical things. In a way, our responsibility is to invent the future of language, not demand it’s meaning today is restricted to what it once meant to past cultures. The transfer of meaning occurring naturally cannot be curbed. It must be mitigated with purposeful new language introduction. Marked “thobject”, thanks, will try it’s memetic power. What do you think about the objecthood notion? And word? nice. illusion is granted objecthood. I think there is no need to invent new words. Objects are degraded, dead versions of things, evidence for other things but otherwise no longer interacting with reality. Reality is the one of things, not of objects, this is a failed philosophical program: first to rely on objects because one abhors discussions, interactions, then putting back interactions by the backdoor, for objects. Since objects are by their definition non-interacting, then there is in the background all this smoke and mirrors which tries to bootstrap objects to things. During this process of putting objects first, which was a very naive thing to do, the meaning of thing and object have been mixed or even reversed. But there is no need to be led by bad choices, language is full of words which have clear meaning, other than the one used by media people, like romantism or decimation. Things and objects are also like this. One big problem with the internet of objects is that the designers want to eliminate or stream along rigid paths the reality of the things. Of course that people will use it in the wrong way (from the morlocks point of view), like they did with the social web, which was not at all anticipated by them.